Local Housing Allowance (LHA) rates determine the maximum amount of Housing Benefit that can be paid to subsidise private rents. Reforms implemented in 2011 aimed to limit housing benefit expenditure. For tenants living in privately rented accommodation, Housing Benefit entitlements are calculated using the Local Housing Allowance (LHA). LHA was introduced in 2008 for tenants living in deregulated private rented housing. The primary aim of LHA was to ensure that Housing Benefit entitlements more closely reflected the composition of households claiming it, and thereby introducing greater control over government welfare expenditure. Expenditure on the LHA element of Housing Benefit increased steadily following its introduction as more privately rented households transitioned onto the new benefit, and in line with the wider increase in Housing Benefit expenditure that followed the global financial services crash. Upon taking office, the Coalition Government made further reforms to LHA aimed at reducing expenditure. LHA entitlements are calculated by assessing the rent levels being charged in the local geographic area; these areas are known as Broad Rental Market Areas (BRMA). Currently, there are 14 BRMAs that apply to Greater London. Five different LHA rates are set for different property sizes in each of the BRMAs – these included the Shared Room Rate, and then properties up to and including four-bedrooms. In 2011, LHA entitlements for each of the five property sizes within the BRMA were pegged to the 30th percentile of local rents, meaning that tenants could only receive support for the cheapest 30 per cent of rented homes in the local area. Previously, LHA would cover up to the median cost of renting (the 50th percentile). The uprating of LHA rates were also detached from the local rent level. LHA rates were initially uprated by the Consumer Price Index. In 2014/15 and 2015/16, LHA uprating was limited to a maximum increase of 1 per cent. Between 2016/17 and 2019/20, LHA will be frozen at 2015 levels. Given that Greater London has experienced strong and sustained growth in rent levels, the effect of the LHA reforms has been to create a growing gap between the cost of private rented accommodation and the amount that housing benefit will pay for. All of London’s 70 LHA rates are now below the 30th percentile of local market rents. As of April 2017 the average weekly shortfall between LHA rates and the 30th percentile for the three bedroom rate was £89.84 (or £68.24 excluding the Central London BRMA). 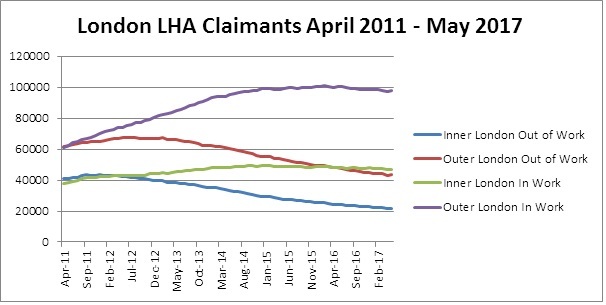 Analysis of London’s LHA caseload shows a shift in claimants from inner-London – where the overall number of LHA claimants has reduced – to outer-London – where the number of claimants has increased significantly. Analysis of London’s LHA caseload also shows a shift from out-of-work claimants to in-work claimants. The 2015 Summer Budget announced plans to freeze LHA rates for the duration of the Parliament. In October London Councils published a report analysing the potential impact of this policy. The report found that the freeze could see the majority of London become unaffordable to private renters in receipt of housing benefit and called for a targeted exemption for London from the freeze. London Councils has consistently lobbied for London’s high rents to be factored into the benefits system. In 2013, the Government set up a two-year ‘Targeted Affordability Fund’ to channel some of the savings from the LHA reforms to allow those rates that had deviated from rents the most to rise by more than 1 per cent. London Councils argued that London should receive the bulk of the fund. In the first year, London received around three-quarters of the fund, resulting in half of London’s 70 LHA rates increasing by up to 4 per cent in 2014 – the only exception to the national cap of 1 per cent on the uprating of working-age benefits. In 2015, 41 of the 70 London LHA rates will increase by more than 1 per cent - with all but one going up by the maximum 4 per cent. But for 2017/18 although 48 LHA rates were uprated by 3 per cent nationally, this benefited only 9 of London’s 70 LHA rates.